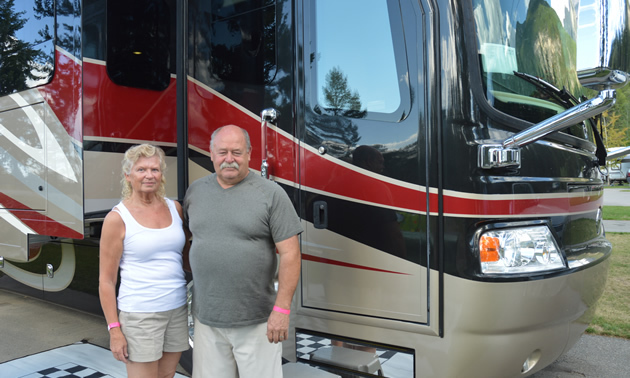 Innisfail, Alberta, is where Larry and Lorraine Layden have their home address, but they spend five months of the year in Palm Springs, California, living in their motorhome. They spend most of their summers enjoying Canada’s parks. Have you been to Fairmont Hot Springs before? Larry: We’ve been here lots of times. My first visit here was in 1962, when it was just the hot pools, tents and a motel. 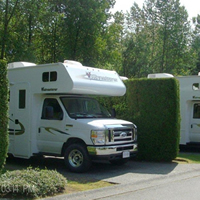 Your RV is a pretty impressive rig. Can you tell me a bit about it? Lorraine: It’s a 45-foot, 2012 Dynasty by Monaco motorhome, and Larry likes to keep it nice and shiny. It has two bathrooms and nice high ceilings and lots of space. We’ve had a couple of other motorhomes, but we think this is the best one and we’ll likely keep this for as long as we’re still RVing. 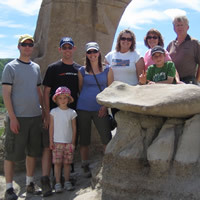 Ryan Van Orman and his wife, Nicole, love the chance to get out camping with their kids and other family and friends in places around Alberta. Leah Taranger and Michael Meinig enjoy taking their two children camping in Alberta in their Palomino tent trailer.